WILLEMSTAD - Rifaat al-Assad is the former vice president of Syria, younger brother of former President of Syria, Hafez al-Assad, and uncle of current Syrian President Bashar al-Assad. Though Rifaat, who is 79 years old, is well connected in his home country, he has been living in exile in Europe since 1984 for attempting to seize power from his brother Hafez. Despite Rifaat’s exile, he has been living rather comfortably, with a bevy of lavish estates to his name across Europe. 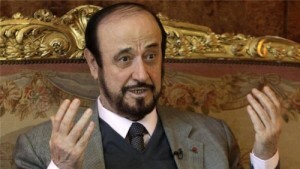 But Rifaat is now in jeopardy of losing many of his properties as a result of a series of raids by Spanish authorities. Spanish authorities announced on Tuesday that they have launched an investigation into Rifaat al-Assad for money laundering. The investigation comes on the heels of a corruption investigation launched by French authorities last year. French authorities charged him with corruption in June 2016, and seized $95 million worth of real estate in France, Curaçao, and Liechtenstein. As a result of the investigations, Spanish authorities seized 503 of Rifaat’s properties earlier this week. According to authorities, the value of the seized properties rests at $740 million. One of the properties, La Máquina at Benahavís, is worth nearly $64 million. Rifaat also owns a little over $82 million worth of real estate in France. Spanish and French authorities are working together on the case against him, in order to investigate whether or not he misused Syrian public funds for his own personal gain. Spanish authorities say that Assad may have taken as much as $300 million from Syrian state coffers for himself. Rifaat claims that the money to buy these properties came from gifts from the Saudi royal family. He told French authorities late last year that former Saudi kings Fahd and Abdullah gave him the gifts.